Restrict Content add-on will add a new meta box named “GamiPress – Restrict Content” on all registered post types with public access. At first time you will see just the Enable Restrictions option. Check it to enable restrictions on this post and to show up all the hidden settings to setup them. The first important setting to set is the restrictions. From this setting you will be able to setup the requirements an user needs to meet. This settings are similar to the GamiPress steps, points awards and deducts and rank requirements controls. Achievements of a specific type earned. All achievements of a specific type earned. Clicking on the Add Requirement button you will be able to add more requirements to this post. Users will be forced to meet all requirements to get access. Users will be able to get access without meet the requirements by expending points. 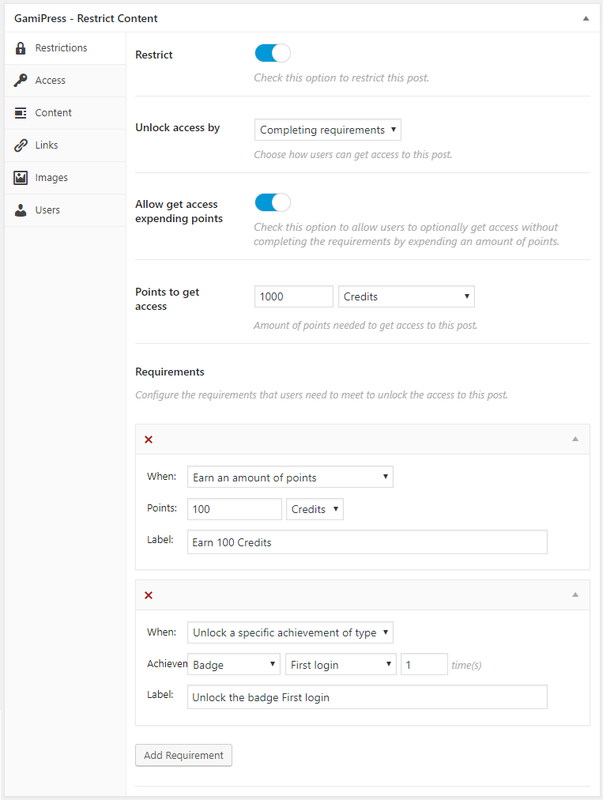 To let users to get access without meet the requirements just check the option Allow get access expending points and setup the points amount and points type required. If you set the Unlock access by field to “Expending points” then users just will be able to get access to this post by expending points. With this setup you don’t need to configure any requirement since there is just one, the required points. 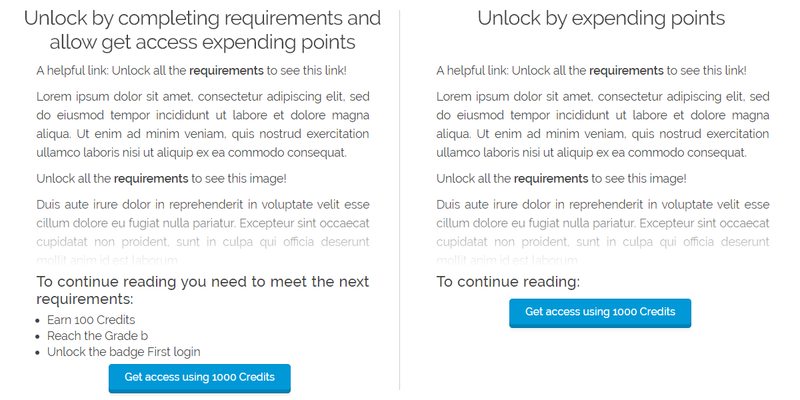 1 – Unlock by completing requirements and allow get access expending points. 2 – Unlock by expending points. Also, the same output will be applied when use the [gamipress_post_restrictions] shortcode and the GamiPress: Post Restrictions widget. Now that you have been setup the needle requirements, lets to configure how we will restrict this post.